There's no way of knowing how many tacos there are in San Antonio. But there's no question which one is the city's most beloved. It's Henry. The stumble-footed mascot of Henry's Puffy Taco Restaurant has been appearing at San Antonio minor league baseball games for 16 years now. "I came up with him when I was in college," confesses Jaime Lopez, the youngest of four siblings who have been running the restaurant since the founders, their parents, retired. "We lived near the stadium when I was a kid and I went to a lot of games. I saw the billboards in the outfield and I always remembered that. When I got older and got involved in the family business I thought that would be a good way to advertise." Lopez took his idea one step further and decided to create a mascot for the business his father Henry had started in 1978 . "When I contacted the Missions and suggested it back in 1989 , their marketing guy was from Denver. I don't think he knew what a puffy taco was. He suggested we use a burrito or an enchilada. He clearly didn't get it." Jaime can't pinpoint the origin of the family's secret recipe. "My uncles made them at their restaurants in California and my grandmother made them too. I can't really say who started it, but it's been in the family for generations." 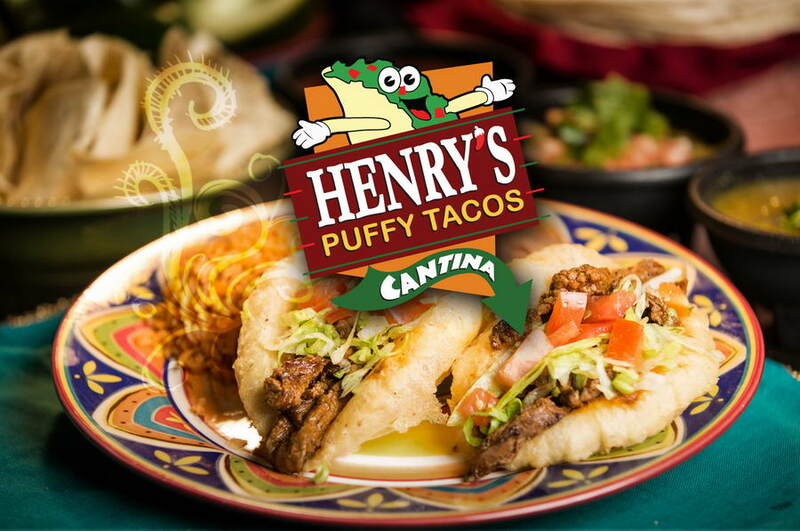 While Henry's filling is standard taco fare, the dough used to make the shell puffs up when cooked giving the dish a cloud-like appearance, making it look more like pastry than an entree. Henry's also has more traditional Mexican dishes including enchiladas, tamales, burritos and regular tacos. The restaurant is as much museum as eatery with Latino memorabilia such as boxing gloves, mariachi costumes and musical instruments on display commemorating famous athletes and performers. Aside from hamming it up with his partner "Ballapeño" between innings at the AA Missions' games, Henry's main role is to race around the bases with a youngster chosen from the crowd. The young fan has to beat Henry to home plate to win a free dinner for the family. There are puffy tacos on every ticket. Henry always manages to lose, but it's not always easy. He's been known to take a dive. "I don't remember exactly when it happened, but one night the kid stumbled and took Henry's legs out," explains Mickey Holt, director of public relations for the Missions. "Ever since then it's become a tradition to tackle him between third base and home plate. He takes a lot of abuse but everybody loves it. He's a huge hit." That abuse means the Missions have to order a new costume every season. "We go through at least one a year," Holt adds. "It's not really meant to be mistreated the way we do. Plus, we have a couple of spares. Henry can be in more than one place at a time. He's all over town during little league season." The Texas legislature, which knows a good taco when it sees one, honored Henry in 2003 with House Resolution 490 recognizing him as, "truly entertaining, hopelessly endearing and curiously appetizing." He's also been named the "Best Mascot in the Minor Leagues" by Newsweek Magazine. For those more interested in eating tacos than chasing them, Henry's is a local landmark. "Almost all of our business is local," Lopez says. "We're not near a highway and we're not downtown, so people have to find us. All the locals (including any cab driver or concierge) know where we are but tourists don't know how to get here." The original Henry's was a tiny 1,000 square foot mom-and-pop operation and featured a forerunner of the modern drive through. "I guess my dad was pretty innovative. You could call in your order and he had a window where you could pick it up when you got here without having to get out of your car." Today, having outgrown its first two locations, the restaurant is a more spacious 7,500 square feet and employs 55. "I started working here when I was 13," Lopez says. "I fired my first employee when I was 14. I guess that's when I became a manager. My dad told me, 'if you've got the guts to fire them, then you have to do their work.' So I did. My family did everything back then. My mom had a regular job during the day and then she was the cook at night. My dad was here all the time. There were times back then when the closing crew might be me, my brothers and maybe two other people." There were never any expectations for the children to go into the family business, but there was never any question either. "We all knew we wanted to be in the restaurant business. My sister is the only one who's ever worked anywhere else." The oldest of the four Lopez children at 42, Rick is the general manager. Robert, 39, is the growing company's CEO. Imelda Lopez-Sanchez is 36 and the head of human resources and Jaime, at 35 is the CFO. With sales of $2 million in 2004 , the restaurant is thriving. Plans are in the works for a second location to open on San Antonio's north side in 2006. Currently, Henry's sells between 1,000 and 1,500 of its signature dishes a day. "There are puffy tacos on every ticket. It might only be one person in a party of three, but there's always somebody ordering the puffy tacos." During its 27 years of existence, Jaime estimates the restaurant has sold somewhere in the neighborhood of 10 million. But there's one that's not for sale. Serves four. Place all contents into a one-gallon pot. Cover pot, cook on high heat Allow one hour for stew to cook or until meat is fully cooked and very soft. Remove excess broth from pot. (Leave a small layer of broth over stew meat.) Leave stew simmering until gravy mix is ready. 4 oz. all-purpose flour lightly browned in a saucepan. After browning flour, place browned flour into a small mixing bowl. Add 4 oz. of cold water. Strain mix to remove any flour balls that may remain. Pour mix into the pot of simmering stew. Allow stew to thicken. Enjoy with flour tortillas, rice and refried beans.